AlwaysWin Expert is a fully automated robot which opens/closes orders on the market on your behalf, it has a very simple setup, on which you keep full сontrol. What Is Forex? What’s an Expert? Forex stands for Foreign Exchange. You can exchange money (dollars, euros, yens, pounds…) and make profit from the variations between them. To trade Forex, you simply need a Forex account, that you can open from many available Forex Brokers. 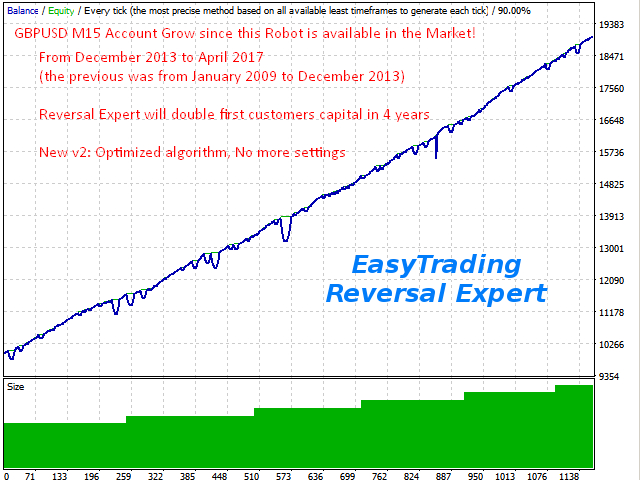 I have accounts from many brokers (ActivTrades, FXCM, Alpari, AAAfx…) to test my products, it is very easy to open one. Some of them only require a few euros to begin (€300/$300). run Expert Advisors: they’re robots which will trade for you. Here is MetaTrader screenshots: MetaTrader 4 Gallery. The Expert advisor works on many currencies (I'm currently testing the robot on every available market I can find), been tested on every major brokers. I’ve worked on it for three years, and now it is fully automated. It does everything alone: finding entries, exits, lot size, taking volatility into account. See the screenshots below and start making money right now with our 100% automatic robot. Since it's a robot, no emotion can prevent your capital from growth. I’m not fooling you with a 100% winning rate. If you have some experience in trading, you know that a 100% winning Expert Advisor only waits for the position to be in profit. But this can take days, months or years, and your margin won't survive. AlwaysWin Expert manages losing positions to recover the profit. THIS IS NOT A MARTINGALE SYSTEM. I’ve studied martingale for months, I can say I've mastered it. A martingale system doubles the lot size until there is a win, so you always win in the end. This is very dangerous, there is no martingale here. This Expert Advisor uses its own method. The good news is that IT IS 100% AUTOMATIC. I love easy tools. I put some full tests with full results on an external website so you can check: AlwaysWin Expert. I’ve studied Forex trading for years. Everywhere on trading forums and seminars, I meet people whining because they lose money. They have everything in hands to win (systems, online education, time…) but they still lose money. Why? The NUMBER ONE reason is always the same: EMOTION. You make some profitable trades, you feel confident, then you dramatically increase your lot size and finally you LOSE BIG? You find a good entry so you open a position. Only after that you wonder when you should close it. Have you ever opened a BIG position only to make 1 or 2 pips and feel good? Do you think you can become rich quickly? Do you know that you should write all your trades in a log to review them. Do you follow that rule? If you find some of these familiar, AlwaysWin Expert is for you. This Babypips.com article describes the problem: 4 Psychological Pitfalls That Will Blow Your Account. I developed AlwaysWin Expert so that it bypasses all these issues by being fully automated. AlwaysWin Expert has no fears. Positions will be closed at the right time, whether in profit or not. AlwaysWin Expert is patient. It can wait for days or weeks without doing anything if there is no opportunities. AlwaysWin Expert doesn't feel the shame after a lose. AlwaysWin Expert is not greedy. The lot size is mathematically computed from your wanted revenue and your available balance. AlwaysWin Expert doesn't sleep. Positions can be opened or closed at any time whenever the market is open. You won't have to learn all the Forex terms and technics, AlwaysWin Expert knowns them all. You won't have to monitor your money, AlwaysWin Expert knows its job. You won't have to follow the economic news 24/24, they have no impact on AlwaysWin Expert performance. You can safely launch AlwaysWin Expert and forget about it. The only thing to do is to tell it how much you want to earn. Before we get into the details, how is Forex account used? The money you put into your Forex account that is available in your MetaTrader platform isn't used directly when you open a trade. Instead, your money only absorbs when there are losing positions. For example, if you buy 1 EURUSD lot, your equity won't move. Then if the EURUSD market value goes up, your equity will grow. If the EURUSD value is going down, your equity will decrease. Brokers have automated processes to automatically close your positions if your equity comes too close to 0. This is called Margin Call. Now, you want more money, you have to take more risk by increasing the lot size. If you are too greedy, you'll get Margin Call. So please don't be greedy. You need a MT4 account. Very good and profitable EA,signal from 2014 speaks for itself. One of the best EA available in the market, five stars. It work's fine with good results. If it don't generate new positions, your risk is too small for your balance. For 1000 € put your risk at 0.3. But be careful: 0.3 is high risk (my opinion). Better you use bigger balance with 0.1 or 0.2 risk. Camille is very helpful. Don't hesitate to ask him! НЕ покупайте он не работает ! I have been running this EA now for one month. Very good result. Result of one month: 5% profit, 1,2% DD, max leverage used: 4. You can set the risk higher, but the DD will increase exponentialy. 24-7-2016 One of the oldest EA's (2013) Very stable and easy to use, the EA has just one setting. Camille is very friendly and helpful. I do have bought it. It doesn't work at all. My pc is slow about it and I have to restart mt4 all the time. Smile face is down :( can't let is be :). No explenation how to do it better. Wow, this is so good.Camille thanks for making this available. I rented a virtual server and turned this robot on, wow is all I can say. I'm rarely interested in other people's EAs because they've let me down every-time. I learned to program so I could take matters into my own hands, however, Camille and I talked on and off over the last 2 years and I liked him so much that I decided to buy this Always-Win EA and I'm happy with it. All trades- yes every trade so far has been a winner! Good job Camille :) Your indicators and EA are fantastic! - No more settings: lot size is calculated from the balance.